One of the great films/movies of 1999 is David Cronenberg’s eXistenZ ™, starring Jude Law, Jennifer Jason Leigh, Willem Dafoe, Christopher Eccleston, Ian Holm, and Sarah Polley. Here’s a plot summary: Allegra Geller (Jennifer Jason Leigh) is the designer of eXistenZ ™, a new game system so advanced it uses biology to transport players into gaming experiences beyond virtual reality. Allegra is a star – worshipped, cosseted and constantly under threat from fanatics and rival game companies alike. It is up to Ted Pikul (Jude Law) to protect her. When a terrorist attack disrupts the first ever demonstration of eXistenZ ™, Geller and Pikul find themselves on the run in a strange and dangerous world where reality and fantasy merge and in which Geller and Pikul discover they can trust no one – perhaps least of all each other… for who can really tell where real life ends and the game begins? 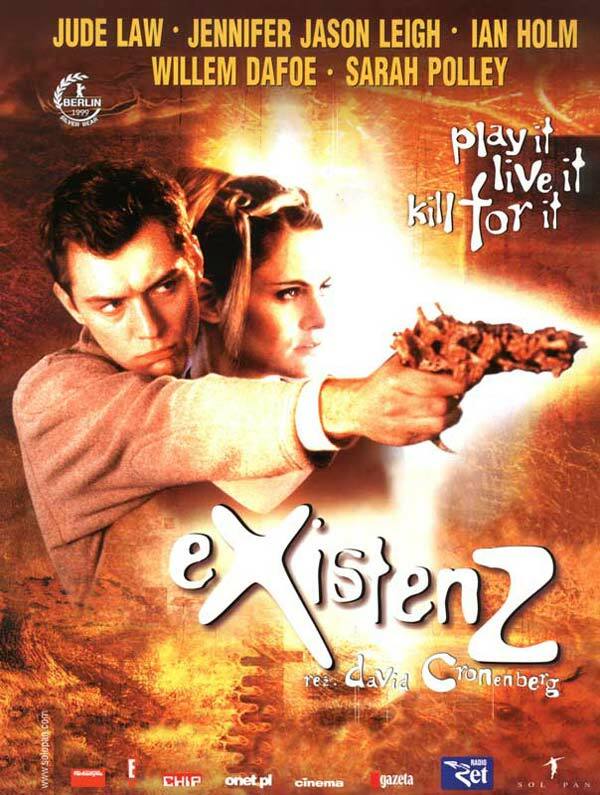 Frighteningly vivid and tense, David Cronenberg’s eXistenZ ™ is a terrifying journey through betrayal, death, and the seductive world of game playing. It tackles notions of identity, art, creativity, the dangers of fiction, the reality/cyberspace dichotomy, and Martin Heidegger’s notion of ‘being’. 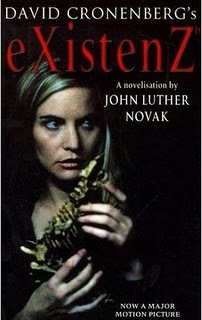 David Cronenberg’s eXistenZ ™ has been turned into a fast-paced and very well-written novel by Christopher Priest (writing as John Luther Novak). Priest follows Croneberg’s plot precisely, but has added extra detail to round out the characters and the situations. There is also a graphic novel, David Cronenberg’s eXistenZ ™, with illustrations by Sean Schoffield. The 110 page graphic novel, published by Key Porter Books, contains set of a cast pictures, a glossary of technical terms, the graphic novel itself, and an interview with David Conenberg talking about the pre-production, the filming and the aftermath of eXistenZ ™. Each of the different versions of eXistenZ ™ is worth a look. Watch the film/movie, read the novel, listen to the music, or enjoy the graphic novel – they’re all worth spending time on. David Cronenberg’s eXistenZ ™ is a razor-sharp science fiction thriller – with an intriguing plot and some great acting from Law and Leigh. 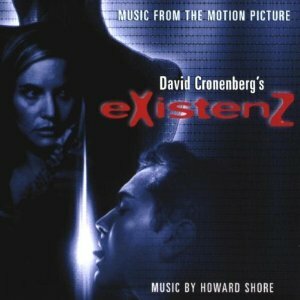 Try David Croonenberg’s eXistenZ ™ – you might enjoy it.